Home Christine Gordon Fresh Evidence of Life on Mars? 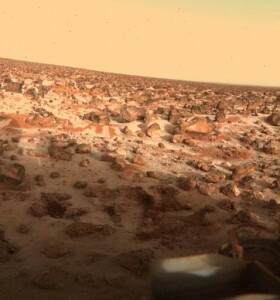 Recent scientific experiments reveal that in 1976, NASA’s Viking mission to Mars may have found life. At the same time that a recent photo showed NASA’s latest life-seeking probe, Curiosity, looming high above the Martian landscape– its swollen shadow splayed out on the ground below it—fresh evidence published in the International Journal of Aeronautical and Space Sciences suggested that an earlier mission to the red planet may have discovered life. In 1976, NASA launched two Viking probes, Viking 1 and Viking 2, to capture high-resolution surface images, characterize the structure and composition of the atmosphere and surface, and search for evidence of microbial life on Mars. The first two goals were wildly successful, however the third objective was a matter of controversy. Those who remember viewing many of the Viking mission’s 1,400 photo images were treated to stunning shots of wind blown surfaces and an equator littered with giant canyons. Pictures showed a landscape designed by water — there were obvious signs of erosion that scientists said were caused by the ebb and flow of ancient floods, rivers and even rain. Several images revealed the remnants of an ancient river delta with features hammered in by the force of 10,000 Mississippi Rivers. And then, the crème de la crème, a photo beamed back to Earth in 1979 of rocks covered in frost. In the 1970s Dr. Gilbert V. Levin, now an associate professor at Arizona State University, designed a life seeking experiment that traveled with the two Viking rovers. The experiment, called Guilliver (it was designed to find small things…microbes), and later renamed the Labeled Release (LR) apparatus, performed nine experiments on Mars’ soil samples. Some of those samples were taken from a distance of 4,000 miles apart. In the experiments, soil was mixed with a chemical cocktail that included a drop of water, nutrients and radioactive carbon atoms. Lactate and alanine were included to detect alien metabolism that might require amino acids and sugars. Levin and other scientists believed that if microbes were present they would metabolize the nutrients and release carbon dioxide or methane gas, a reaction that can be measured and compared to the circadian rhythm found in all living things. As soon as the contents were blended with the soil the radioactive counts spiked skyward, well beyond the natural background radiation on Mars. Levin believes these results constituted evidence of life. However, other LR experiments came out negative, and NASA set aside the claim. Recently, Levin and several colleagues looped the LR data again– this time they used mathematical tests to separate biological signals from non-biological signals. They also used cluster analysis, which groups together similar looking data sets. Viking’s findings were also compared to source material on Earth, including temperature readings from a rat. The results showed that all of the biological experiments sorted with the active experiments from Viking, while the non-biological findings sorted with the control group. Levin said the findings mirrored Viking’s original positive for life results. “It’s hoped that these results will help bring about a long overdue paradigm change, and educate the public that we are not alone in the universe,” said Levin. This August, NASA’s Mars Science Laboratory, also referred to as Curiosity, will touch down on the Martian landscape to begin its nearly two-year search for conditions favorable for life. Levin believes the lander will find organic matter, and that other evidence will be consistent with Viking’s findings. “It’s very difficult to believe that there isn’t any organic matter on Mars, since our neighboring planet is subject to the same influx of matter from space and the same photosynthetic production as Earth,” he said. In 1979, Levin published Viking lander pictures that showed greenish patches on some Martian rocks. He has asked Mike Malin, the principle investigator of Curiosity’s hi-resolution camera, to look for rocks such as those photographed by the Viking Mission more than 30 years ago. “The camera’s resolution might be able to distinguish details peculiar to biology, such as the lobate forms in which lichen grows and even the cellular patterns,” said Levin. This week, CERC intends to feature the first in a series of classes that examine how smaller organisms affect life on a grand scale. While scientists know the structure of microbes there’s still much to be discovered. “The Little Things and Their Influence on the Planet,” a course that is part of the Certificate in Conservation and Environmental Sustainability, investigates the role of microorganisms in maintaining our biosphere. It meets on Thursdays, May 31, June 7, 14, and 21 (4 sessions; 6:10-8:40PM), and is available both in class and via distance learning. For more information, please contact Desmond Beirne at cerc@columbia.edu or 212-854-0149. Christine M. Gordon is a freelance journalist. She recently wrote a profile on Claudia Li, founder of Shark Truth, a Canadian non-profit that is working to end the consumption of shark fin soup.